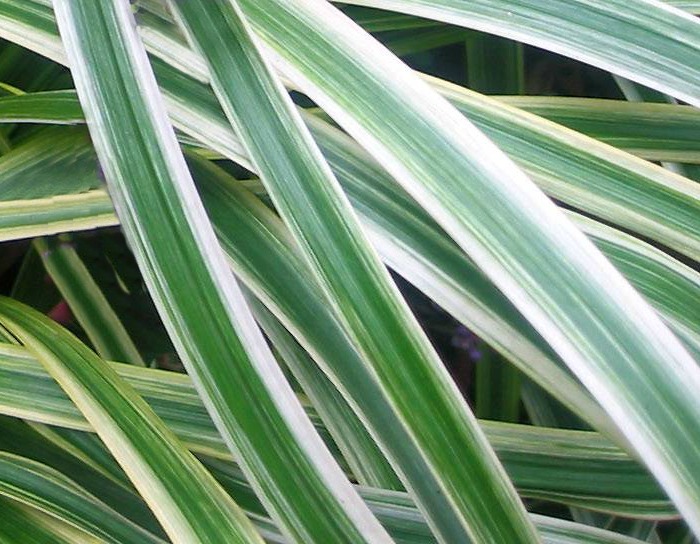 This interesting perennial plant has vibrant yellow stripes along the arching dark green foliage. I love the way it adds color to my perennial garden beds. The plant is a member of the Asparagaceae family. Variegated lilyturf grows as a clump forming ground cover, It has tuberous roots and spreads easily to cover the base of your garden. I like to alternate the clumps with the plain green variety of monkey grass as a border around my garden beds. One of the nice things about the plant is that it is evergreen and will add interest in your garden all year long. 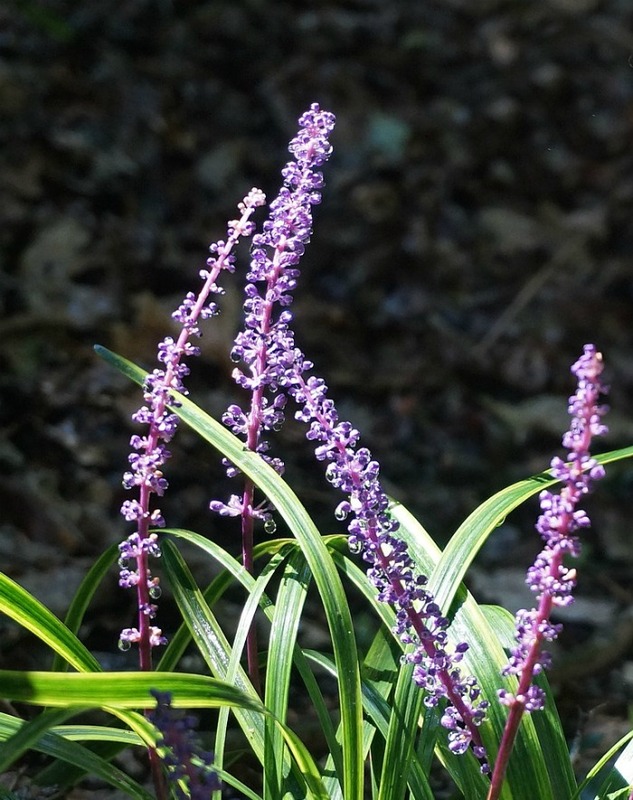 Liriope muscari variegata is a slower growing variety of the lily turf plant. Each clump grows to about 1 1/2 feet tall and about 2 feet wide when mature. Since it does not spread as quickly as the plain green variety, it is easier to maintain in a garden. 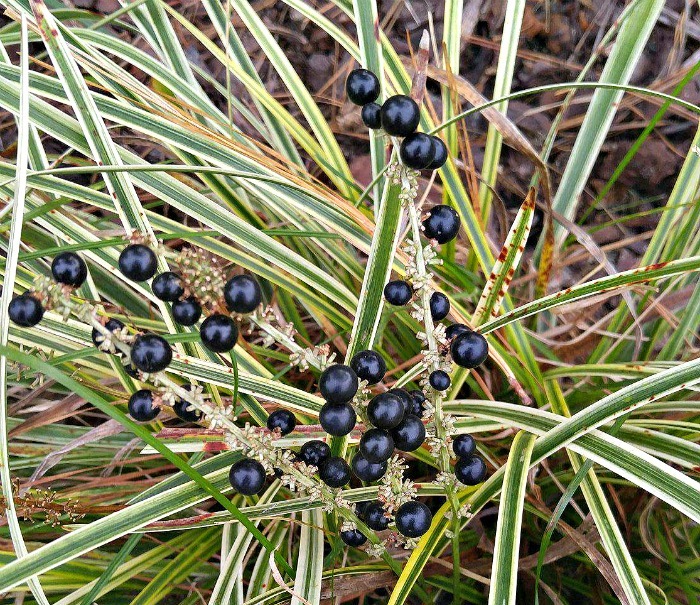 After flowering, variegated lilyturf produces clusters of blackish berries that persist in the autumn and early winter months. 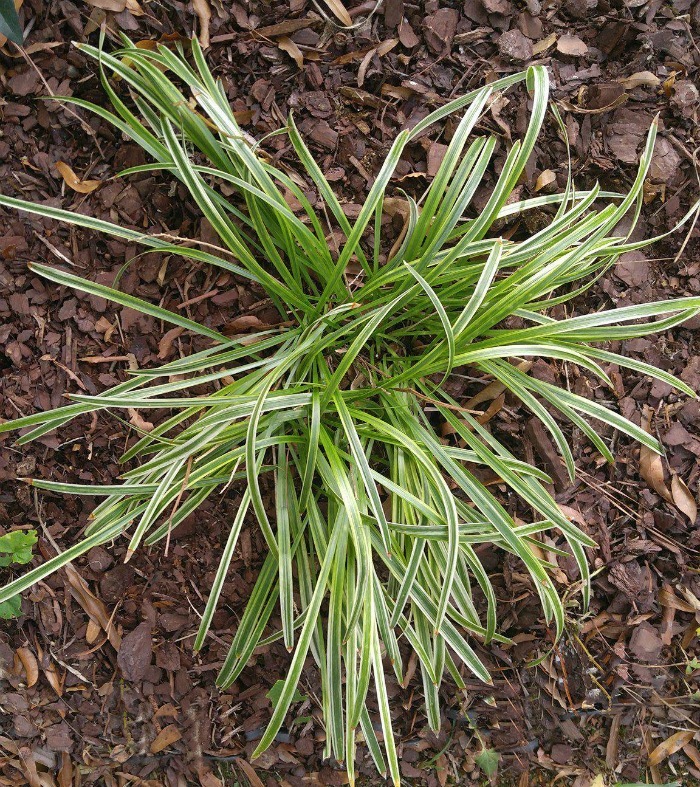 The leaves of variegated lily turf have an aching habit with a medium green color. The leaves which are variegated with creamy yellow margins that are very pretty and add lots of interest and a pop of color in the garden. This perennial is remarkably tolerant. it will grow in full sun to part shade. Full sun in the hottest zones will result in the leaves having a bit less vibrant color. Since the plant spreads from the bulbous tubers, it is often used as a ground cover. 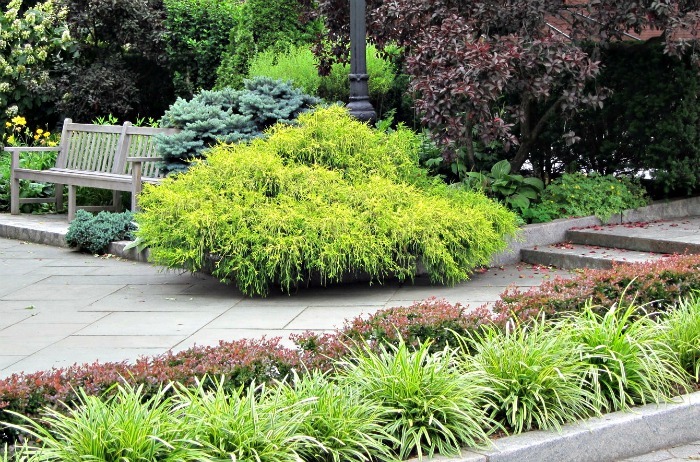 Another great use of the variegated lilyturf is to plant it closely along the edge of a garden bed. It makes a very pretty garden border that grows tightly together over time and is helpful at keeping weeds out of the border. The photo above was taken in NYC Wagner Park, in Battery Park City, NY and shows this technique beautifully. The plant needs little maintenance but can get a bit shabby over the growing season. 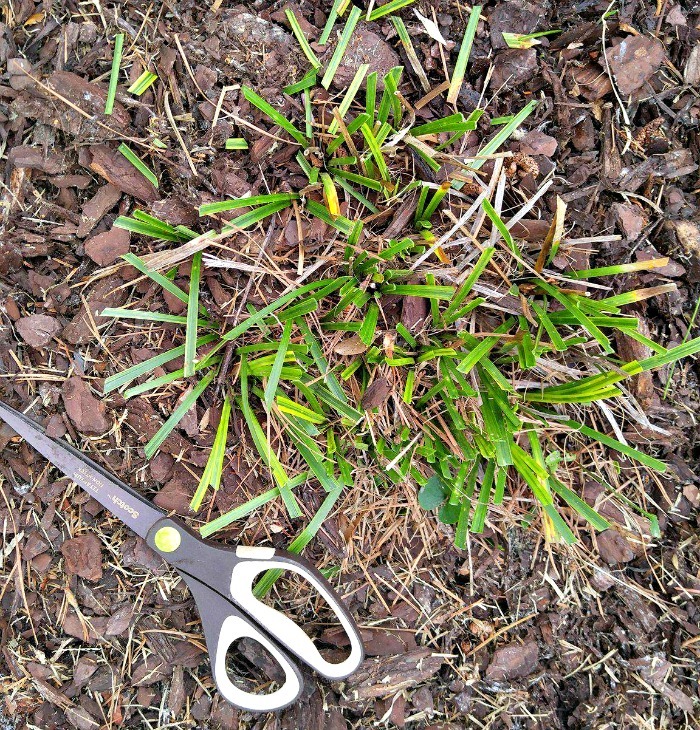 I like to use sharp scissors and give my plants a “haircut” before the active growing season each year, in early spring. New growth with sprout all over the plant and this pruning will remove the tattered leaves. If you don’t want to use variegated lilyturf as a ground cover, be sure to remove the small plants that will pop up from the tuberous roots near the mother plant. If you grow liiriope muscari variegata as a ground cover, just mow over it in early spring to give the plant a new lease of life and to tidy up the foliage. Variegated Lilyturf is a great choice for problem areas of a garden, such as under the shade of a tree where not much else will grow. The creawy striped grass like foliage and pretty purple flowers add interest year round. The plant is tougher than most and is a great choice for beginning gardeners. Follow these few tips and you’ll be able to enjoy this pretty perennial in your garden.